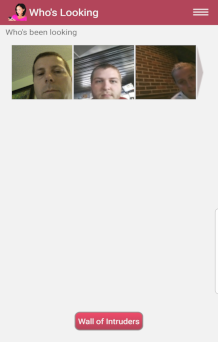 Who's Looking is an easy to use app that will catch someone trying to unlock your phone, and help you find a lost or stolen phone. Unlike other apps Who's Looking does not require your information to be sent to a web server for you to view. People trust us to protect and find their phones, and we take that responsibility seriously. Protect it from prying eyes! Who's looking at your phone when you leave it unattended? 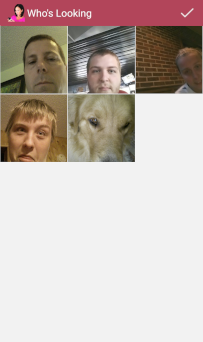 Who's Looking will catch those trying to unlock your phone to look at your private data! 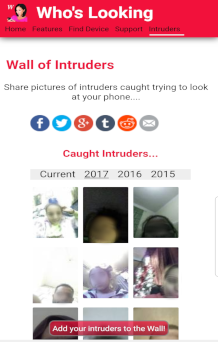 When a failed unlock attempt occurs the intruders' photo will be taken alerting you to who’s trying to get at your personal data on your phone. Lose it. Track it. Find It! 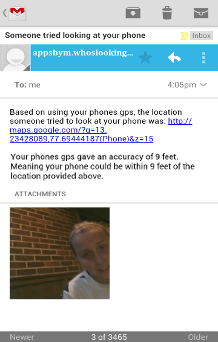 With Who's Looking you can track and find your phone from anywhere with a text messaged phrase. Who's Looking can turn the ringer volume up and make your phone ring. Not near enough to your phone to hear the ringer? 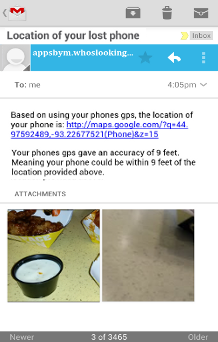 The app can get the GPS coordinates with a link to Google maps along with pictures of the location and email it to you.